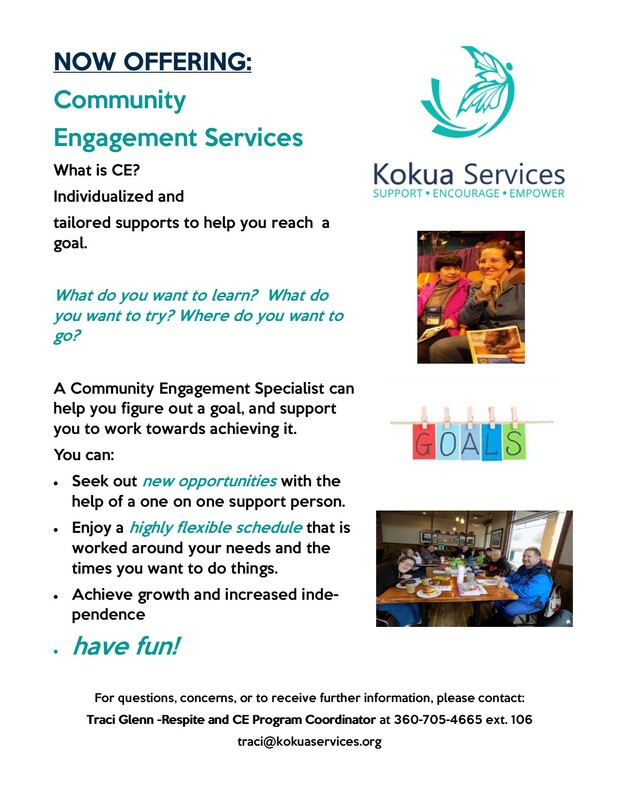 Through Kokua’s Community Guide and Community Engagement Services, you will be paired with a one-on-one support person to create an individualized plan to achieve your goals. This service is highly flexible and allows for you to schedule sessions and outings that are tailored and designed to fit your schedule and individual needs. It is a great opportunity to explore new activities and receive individualized support for growth and increased independence. 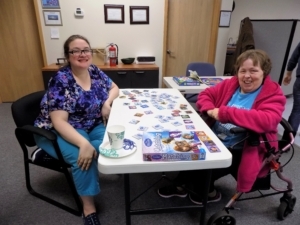 Some examples of goals that one could set for this program include: improved fitness, learning about new activities or life skills such as cooking, meal planning, budgeting, outdoor exploration, increased community engagement, and socialization opportunities, channeling creativity, and more! Our staff is highly trained. Kokua requires all staff to complete 40 hours of classroom training in addition to Nurse Delegation (with NAR Credentials), First Aid and CPR, Blood Borne Pathogens, and 30 hours of peer coaching. Staff are also required to complete 12 hours of continuing education each year. 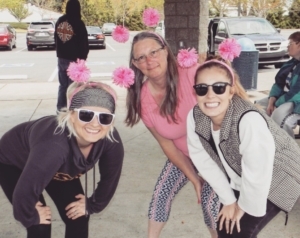 All staff have passed intensive background checks and all drivers possess valid Washington State drivers’ licenses and have clean driving records. Program Fees and Billing – Kokua will bill DDA directly for Community Guide/Engagement Services. All services require prior authorization from your DDA Case Manager. Transportation will be arranged as needed to achieve your goals. Kokua may opt to transport in one of our agency vehicles or we may walk or take the bus to enjoy community events. Please be prepared to ride the bus by bringing your Intercity Transit bus pass or $2.50 for a daily pass to every meeting with your Guide. Kokua staff are trained to support you in many different activities. Please let staff know if there are specific things you may need. If you require assistance with any of the following, please call to discuss what accommodations might be made to serve you. 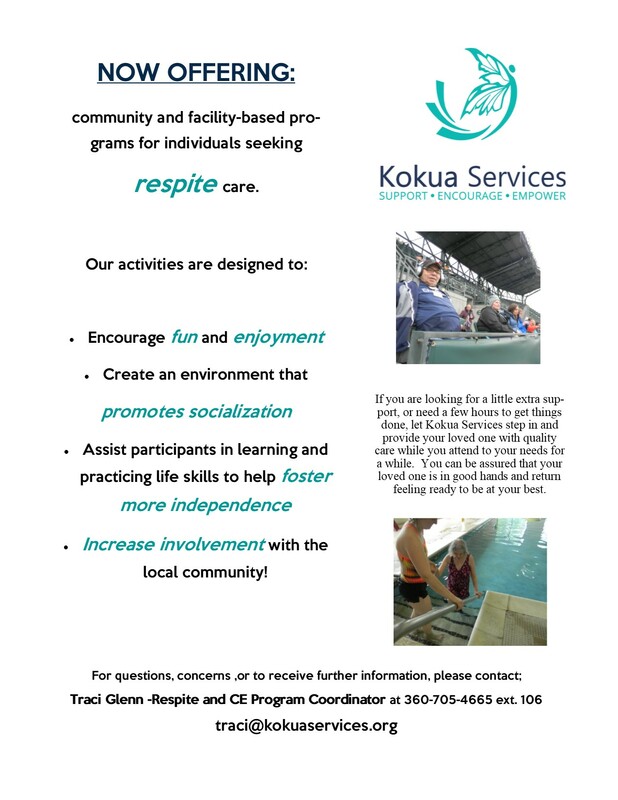 Kokua offers community and facility-based programs for individuals seeking respite care. Our activities are designed to encourage fun and enjoyment, create an environment that promotes socialization, assist participants in learning and practicing life skills, and increase involvement with the local community. Program Fees and Billing – Kokua will bill DDA directly for respite services at a rate of $16 per hour. All services require prior authorization from your DDA Case Manager. Activities that require clients to bring money (lunch bunch, movies, etc.) are noted in the monthly activity calendar. Unless otherwise stated in the activity description, Kokua Services does not provide meals or snacks during activities. Please be sure to pack a snack if you feel you may need one. Some activities may require a sack lunch. Kokua does not provide transportation to or from activity meeting areas. You are responsible for setting up transportation either privately or through Intercity Transit/DAL. 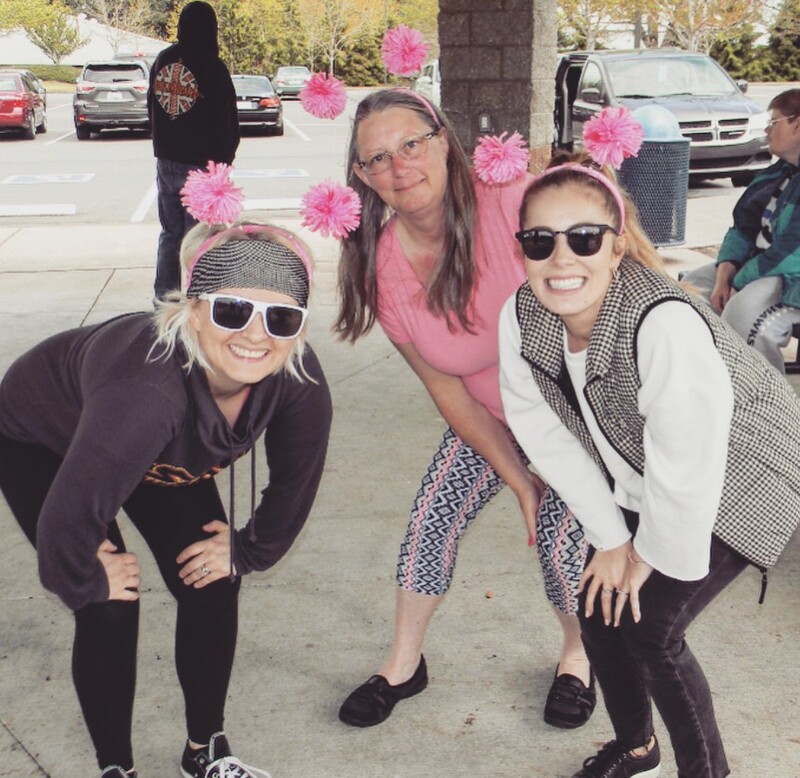 During activities, Kokua Services may opt to transport in one of our agency vehicles, or we may walk or take the bus to enjoy community events. Please be prepared to ride the bus by bringing your Intercity Transit bus pass or $2.50 for a daily pass to every activity. How did you hear about Kokua?